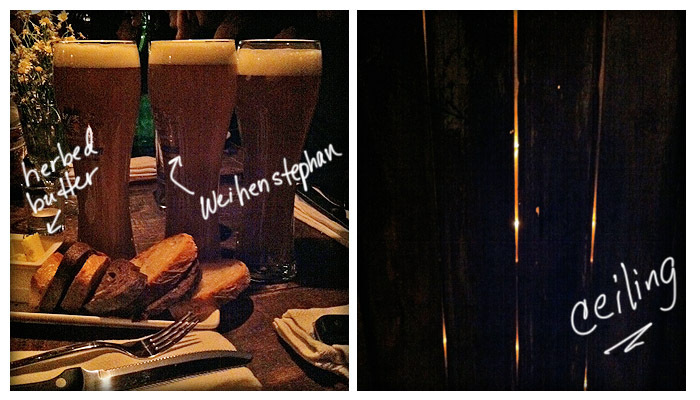 For this week’s review, I toddle off to Alphabet City for an evening of Austrian food and beer at Edi and the Wolf. I first learned about this new resto from the Thrillist newsletter. Since Thrillist’s pickings are deemed more “manly”, it seemed only fitting that it was ladies’ night on the LES. At first glance, the look of Edi and the Wolf is Miss Havisham’s attic meets hunter’s lodge with a dash of nautical flair (see the giant docking rope snaking its way around the bar area). Yet, it’s all done very stylishly: the spaces between the wood paneling on the ceiling allow for narrow beams of light to peak through (a nice effect), while the wood communal table in the middle nicely complements the cozier booths along the sides of the dining room. We arrive around 9pm and the place is packed with schnitzel seekers. One of my accomplices had the presence of mind to wrangle us a reservation, so after a quick loiter (with beer) at the bar, we are seated in one of the booths. It’s a tight squeeze, but we make it work and then immediately make it more crowded by ordering three monster-sized Weihenstephan beers (I said manly, right?). I nice golden wheat beer, these go down quite easily. As we drank our over sized beers, we perused the menu. I have never eaten Austrian food – at least not knowingly or on purpose. So of course I wanted to try everything. Everyone seemed OK with this approach and so we hailed our waitress over so that we could rattle off our hefty order. 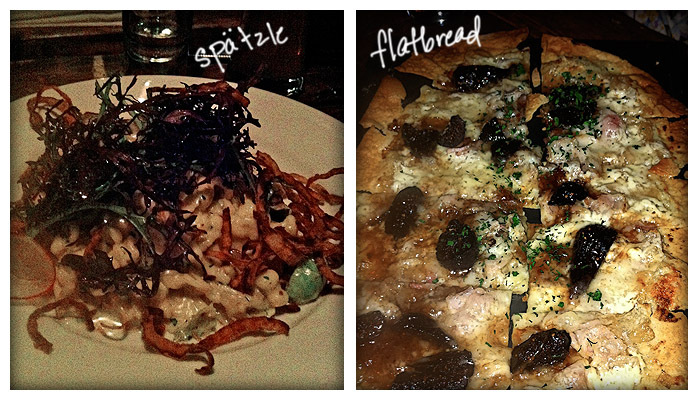 Spätzle with Wild Mushrooms and Brussels Sprouts and the Alsatian Flatbread featuring cured figs and cipollini onions. We would have also ordered the short ribs, but someone had already beaten us to it and eaten their entire supply for the night. For me, the standout was the flatbread. The cippolini onions were caramelized so nicely. Paired with the figs it gave a nice candy contrast to the herbs and cheese. True to its name, the bread was indeed flat – incredibly crispy, and well-baked, but still with a slight give that separates bread from crackers. I really enjoyed it. As for the Spätzle, this was something different. To be honest, I’m not sure if I really liked it, or was just fascinated by it – its combination of flavor and texture. It was served with wild mushrooms and brussels sprouts and some very thin, shoestring-like fried onions. The crispy, sharp onions provided a nice (and needed, as my one friend pointed out) contrast to the soft and creamy Spätzle, while the mushrooms added a woodsy flavor. Moving towards the entrees, we selected: The Steak with Parsnips, Fried Peppers and Mustard Greens; Slow Poached Farm Eggs (I love breakfast for dinner) with Wild Mushrooms, Apple, Sprouts and Bacon; The Schlutzkrapfen which is an Austrian Cheese Ravioli, with Delicata Squash; and FINALLY the veal Schnitzel, fried and served with Potato Salad, Cucumber and Lingonberry Jam. The standout entree for me was definitely the Schlutzkrapfen. The Austrian cheese tasted to me like a goat cheese, which I thought was a refreshing switch for a ravioli filling. I also really enjoyed the squash (and I thought I detected cauliflower) that accompanied it, as well as the sprinkling of pumpkin seeds for crunch. Very well done. I definitely liked the Schnitzel, but not being an expert, I’m not sure how this one ranks on the Schnitzel Scale of Impressiveness (I’m assuming there is one). That being said, the fry was especially light and crunchy – not soggy at all. And I was especially fond of the cucumbers on the side – they seemed almost like a light cucumber slaw – very light and a good contrast to the fried veal. Our service was friendly if a bit slow. 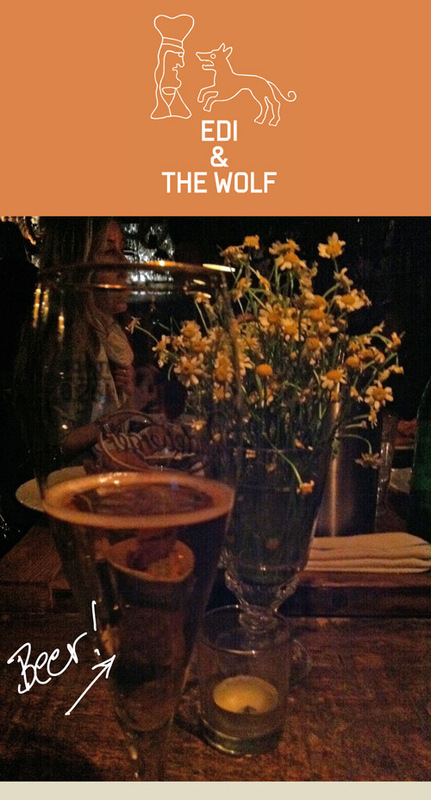 Taking that into account, Edi and the Wolf is a great place to go if you don’t want to feel rushed no matter how crowded it gets. It’s also a boisterous place (not necessarily a bad thing). People are laughing and having a great time in general – no fears of getting “shooshed” here. 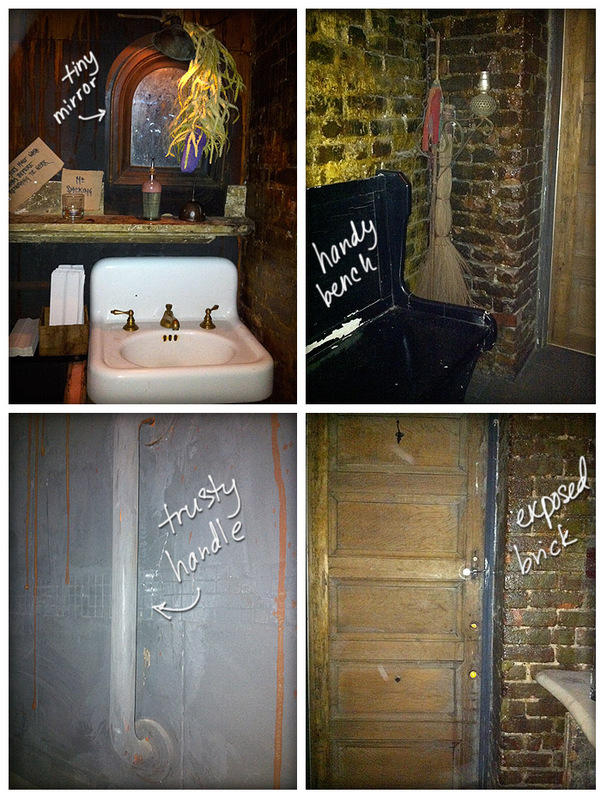 The rustic atmosphere extends into the bathroom (points for consistency), which was spacious and included a bunch of helpful accessories. There was a handy bench for dumping your belongings on, or perhaps having a seat on something other than the toilet if you needed to. A handle was fixed to the wall next to the toilet for steadying yourself after a few too many XL Weihenstephans. However, the mirror was a touch small and smoky. Combined with the low lighting, it was a difficult to see if I had any Spätzle in my teeth. I appreciated the consistent decoration, but a large mirror is helpful. Also, there didn’t seem to be a heating vent in the bathroom. It being December, it was a touch chilly in there. 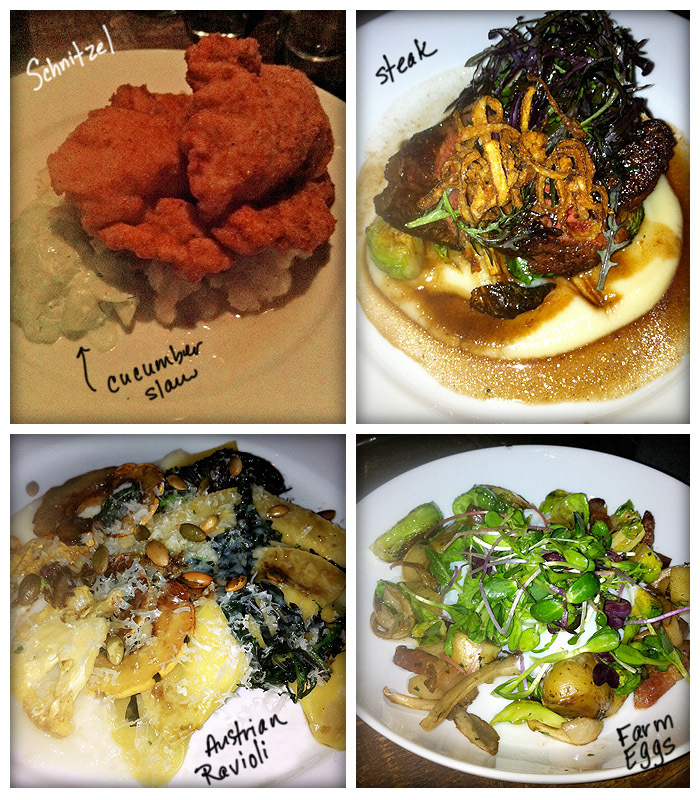 Overall, I really enjoyed my meal and the experience at Edi and the Wolf. The standout dishes like the Flatbread and the Austrian Ravioli demonstrated very thoughtful and well executed flavor combinations. The atmosphere is casual but animated, making it a place to gather with friends, down some beer and explore the cuisine of Austria done Lower East Side style.